The Liturgy is the most powerful and effective form of prayer. 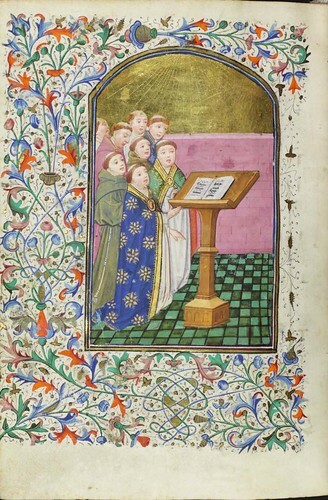 This is the fourth in a series on the Liturgy of the Hours. The others are here. The Liturgy (the Mass and Liturgy of the Hours) is not just powerful and effective. It is the most powerful and effective action of the Church on our behalf. Christ participated in it historically; and continues to do so eternally in heaven and on earth and we participate in His prayer through his mystical body, the Church. I have assumed that as a devout Jew, Christ participated in the Jewish liturgy, which followed a pattern of marking the hours, either three or seven times a day (and once at night) and praying the psalms (which is the basic form of the Liturgy of the Hours). The bible speaks of this pre-Christian practice and its continuation in the Church that He founded (see here) ; and we know from historical records that this tradition has continued to the present day. A lovely example that illustrates this continuation of the thread of tradition is the psalm tune or 'tone' called the Tonus Perigrinus. This came from the ancient tradition of the synagogue, was passed on to the Christian liturgy and became one of the standard chants of Gregorian chant. It has become one of the standard chants of Anglican chant too (listen here). If we are participating in the divine nature (albeit at this stage only temporarily and by degrees for us as individuals) it is no wonder that this prayer is powerful. Scripture, Part of the Foundation of Joy (part three; part one here; part two here) This is from the Office of Readings of Sunday Week 6 of Ordinary Time. It is from a Commentary on the Diatassaron by St Ephrem the Syrian. It certainly inspires me to keep on reading the bible and makes this point that God speaks to me at the level I am at, and so the same piece of scripture can say different things to me on the next reading. The sub-heading is: God's Word is an inexaustible spring of life. 'Lord, who can comprehend even one of your words? We lose more of it than we grasp, like those who drink from a living spring. For God’s word offers different facets according to the capacity of the listener, and the Lord has portrayed his message in many colours, so that whoever gazes upon it can see in it what suits him. Within it he has buried manifold treasures, so that each of us might grow rich in seeking them out. Be glad then that you are overwhelmed, and do not be saddened because he has overcome you. A thirsty man is happy when he is drinking, and he is not depressed because he cannot exhaust the spring. So let this spring quench your thirst, and not your thirst the spring. For if you can satisfy your thirst without exhausting the spring, then when you thirst again you can drink from it once more; but if when your thirst is sated the spring is also dried up, then your victory would turn to harm. I have just one comment on the icon of St Ephrem. Ephrem lived from the first part of the 4th century and in 1920 was proclaimed by Pope Benedict XV as a Doctor of the Church. Among his famous writing are his Hymns of Paradise. The sunken cheekbones in the icon are used to show asceticism. Ephrem was not a monk as monasticism as we know it was only beginning to take hold in Egypt during this period. 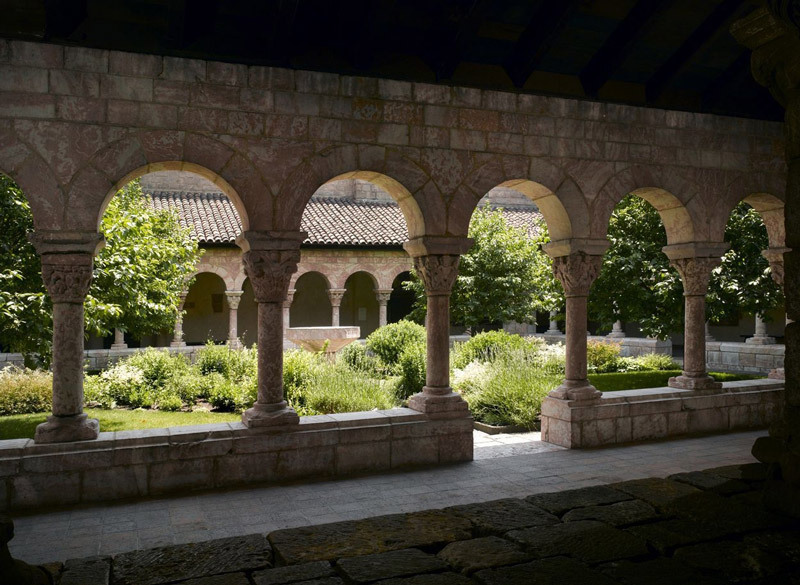 However, he lived in a Christian community that had similar disciplines and he is venerated in the East as an example of monastic discipline. Hence the sunken cheeks. Monastery in the Syrian desert (this is of St Moses the Ethiopian). I hope their spring is inexaustible, just looking at it makes me feel parched! Scripture, Part of the Foundation of Joy (part two; read part one, here) I am not an expert in this at all, but I thought that my experiences of trying (and often failing) to learn the technique and practice it, might be a starting point for others who wish to make a beginning also. Also I would encourage any of you who have experience to offer any helpful thoughts for the benefit of the readership… Before I even began my investigation of lectio divina, the point was made to me that it is good to go to someone who can structure my spiritual life so that all of these things have a unity that allow them to nourish and support my ordinary daily activities. The danger is that I just tack one more devotion onto the daily list of personal obligations without proper understanding of how it relates to the other things that I do and the whole thing becomes a burden, in which I feel guilty if don’t tick all the boxes that day. Now for lectio divina itself: the first part is lectio. This just means reading. The first thing I have to do is select a passage to read. I was told to start with the gospels. If I aim to do it regularly, it was suggested that I try to go through the bible systematically, even if this means that it will take years to go through it once. One person told me another systematic approach to begin with is to pick the readings, or just the gospel reading, for Mass that day. If you don’t have a Missal to hand, www.universalis.com has the readings each day. So having selected the passage I say a short prayer, that I might be receptive to whatever God wants to say to me through the passage I read. And then I read away. As phrases catch my attention I re-read. If nothing catches my attention, I just re-read the whole allotted passage a number of times. One helpful piece of advice given to me was that God will speak to me at the level I am at. So I shouldn’t worry that I am not a scripture scholar who isn’t instantly aware, for example, of the parallels between Old and New Testaments or the allegory that it contains, and so on. However, it is a good idea, I was told to support this lectio, if I have time, with reading of commentaries on scripture, that my understanding might increase in time. I was told to be careful with modern commentaries as many (including some by Catholic writers) do not adopt a starting postion of faith that this is the inspired Word, and so a skepticism creeps into their work. I play safe and go for the Church Fathers and even here I let the Church guide me through her liturgy. The Office of Readings has a passage every day by a Church Father and very often this is a commentary on scripture. So I let the Church educate me as I worship God the Father in the Liturgy. Here is this dynamic, described yesterday, of Liturgy illuminating Scripture and Scripture intensifying my participation in the Liturgy. Again, the Universalis website is a great source for the Office of Readings each day. The second part is meditatio. This means ‘I think’. This was always a source of confusion for me. In this age of post-Beatles, Maharishi Yogi pop culture, I thought that meditating on a phrase meant repeating it like a mantra in Eastern meditation. And that the goal was one of the elimination of thought; or at the very least it was a passive process of just letting my mind drift in the ethereal breeze and see what thoughts might crop up, but without reacting to them. I couldn’t work out what I was supposed to be doing here – it seemed to be contradictory to the idea of trying to understand the passage, which involved the application of reason to what was being read. My predicament wasn’t help by many of the books that I first read about Lectio Divina. Some (perhaps influenced by pop culture too) read as though they had been written by a beatnik writer who described it as an invitation for me to indulge in my emotions through undirected random or stream-of-consciousness style thought, on the assumption that because I had just read a bit of the bible, this was God at work in my mental processes. I was suspicious of this undirected approach. The way out of this changed when I was told something about the distinction between Christian and Eastern, non Christian, ideas of meditation. Meditate, in the Christian tradition means more ‘meditate upon’, the same as ‘think’. So while in meditatio I do pause and allow for the prompting of the Spirit in the form of occurring thoughts and ideas; when they do occur I react to them by mulling over them, perhaps asking myself: what does this mean? Is there something that applies to me directly? How can I act on this in the rest of the day? And so on. This leads to the third stage, Oratio – prayer. So here I can ask God to show me how to act on something or help me in those areas that the meditation highlighted. The worry for me here was that sometimes I didn’t seem to have any profound lessons or thoughts to react to. This meant I didn’t know what to pray, except perhaps, ‘please give me some profound lessons or thoughts’. Here again I was given some helpful advice by someone with much greater experience than me. He said that quite often this happened to him and he didn’t think it was anything to worry about, he simply said some prayers in which he praised God for having this chance to hear his Word. I find that once I start reading, I can move gently from one to the other, reading, thinking, saying a short prayer and then reading again. The fourth part is contemplatio. This is contemplative prayer. As you can imagine, this originally caused me confusion too. I thought contemplation and meditation meant pretty much the same thing. And given the fact that I didn’t initially understand what meditation was, the inclusion of contemplation just compounded it even further. So I needed another explanation: in contrast to mediatio , this part is passive. It is passive in the sense that it is a state of mind that is given to us as a gift from God and actively pursuing it cannot guarantee its occurance. If I have understood the descriptions properly, it is a state of stillness of mind; one of just being with God and it sounds something like the descriptions of the beatific vision when we are in full union with God in heaven. However, as it is a gift from God, I should be careful in interpreting anything from about it or concluding anything about my spiritual development, or about how well I have done the first three stages. God either gives it to me or he doesn’t. Contemplation, therefore, is not a reward or goal of the first three stages, in that sense, it is just something that might happen, or it might not over which we have very little control. For myself, all I can say is that if it happened to me, I didn’t notice (which I’m guessing probably means that is hasn’t happened!). The reason I do this is the reason that I am driven to do any of these things. I believe that ultimately and generally, I will be the happier for doing so, rather than any immediate reward of a pleasant emotion or feeling during the process. At this point, I was going to include another passage from the Office of Readings at the end of this, but given the length of this piece so far, so I’ve decide d to tack on a Part Three, which will appear tomorrow. It is by the 3rd century Father, Ephraim the Syrian. A group of Thomas More College students and myself have just made a trip to the Benedictine community, St Benedict Abbey, which is at Still River, Massachussetts for a mini-retreat. We arrived for sung Vespers in Latin at 6pm and then left after Compline, which finished about 9.15pm. In between the two Hours, we had dinner with our host, the guestmaster, a talk and period of quiet reflection. The guestmaster's talk focussed on the contemplation of Scripture, one of the four 'pillars' of the new liturgical movement - Mass, the Liturgy of the Hours, Holy Scripture and Mystagogy (which I recently wrote about). The form of study of scripture discussed on this occasion was lectio divina. 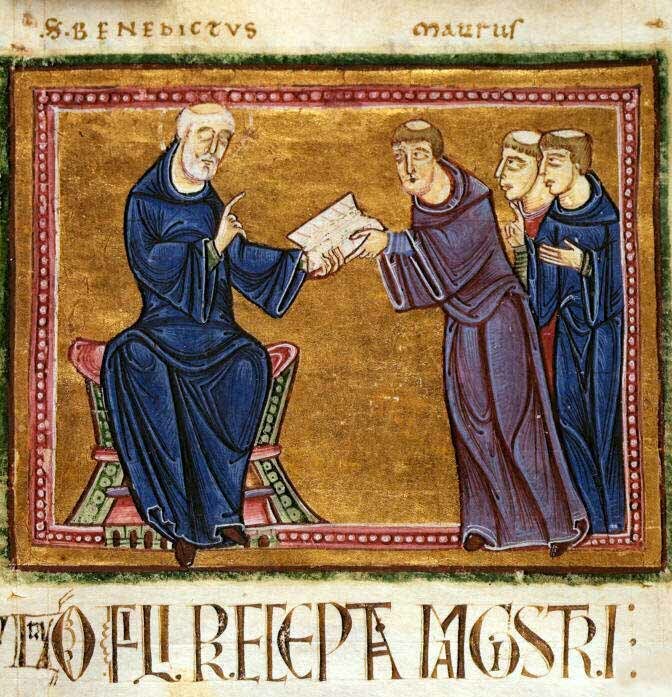 Lectio is required of all monks who follow the Rule of St Benedict, and so I had asked him focus on this aspect to help our students (and me) incorporate it into our daily lives. We were lucky to receive a wonderful, down to earth talk about this form of study of scripture, which gave us some great pointers on how to incorporate it into our own lives. What was so interesting for me was his description of how the the constant practice of both lectio and participation in the liturgy, Mass and the Liturgy of the Hours, each enriches and deepens participation in the other. So a quotations from the bible in an antiphon at Vespers, for example, might evoke the whole biblical context; and then conversely, how the reading of a phrase in lectio, would evoke the season or feast in the liturgy and place it in the context of our heavenly destiny - the worship of God the Father. Through this dynamic, each reinforces and deepens the experience of the other. As a monk, he told us, he spends more than an hour a day on lectio. As it is unlikely that lay people can regularly devote an hour to this, I asked if it was worth trying to incorporate it for perhaps 10 minutes in a day. Would that still be worthwhile. Oh, yes! I was told. What also struck me was how joyfully and generously it was offered to us. Tomorrow, I post a short summarise what I grasped from his talk and describe how I, and amateur at these things, have tried to put this into practice in my daily routine. For those who wish to learn more about lectio divina you could always do what we did - go and listen to someone who practices it and will joyfully pass it on to those who ask. Failing that a book that I found very helpful and practical is "Praying Scripture for a Change" by Dr. Tim Gray. I recently described, here, how in my opinion, these the pillars of the new liturgical movement could be a basis of cultural renewal and as such, certainly, are the foundation of the Way of Beauty. But none of this is worth doing unless it is a source of joy, and our visit to the monastery yesterday reinforced the conviction that this is what the Church offers us. 'The substance and fruit of holy Scripture is very specific: the fullness of eternal happiness. For this is what Scripture is – its words are words of eternal life, and it is written not just so that we should believe, but specially so that we should possess eternal life in which we may see, and love, and have all our desires fulfilled. When they are fulfilled, then we shall know the superabundant love that comes from knowledge, and so we shall be filled with all the fullness of God. God’s Scripture tries to lead us to this fullness, and to the truth of the preaching of the apostles. It is to this end, with this intention, that we should study holy Scripture, and teach it, and hear it. Liturgy is the worship of the Father, through the Son, in the Spirit. By worshipping the through and with the Church, which is the mystical body of Christ, we approach the Father. This is what we will do in heaven and we can step supernaturally into this wonderful place and by degrees (not fully before we die) partake of divine nature in this life. Bonaventure is describing this in this little passage above. The liturgy - the Mass and the Liturgy of the Hours - is how we can do it. The liturgy is described by Church as the 'source and summit' of human existence. Worship of God the Father in heaven what we are made for, and the liturgy is the source of grace that guides us to it. 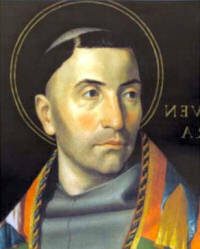 I cannot imagine anything higher than the prize that contains full and eternal happiness, superabundant love and all our desires fulfilled: and this, according to Bonaventure is precisely what the Church offers us. For more about Bonaventure, follow link here. 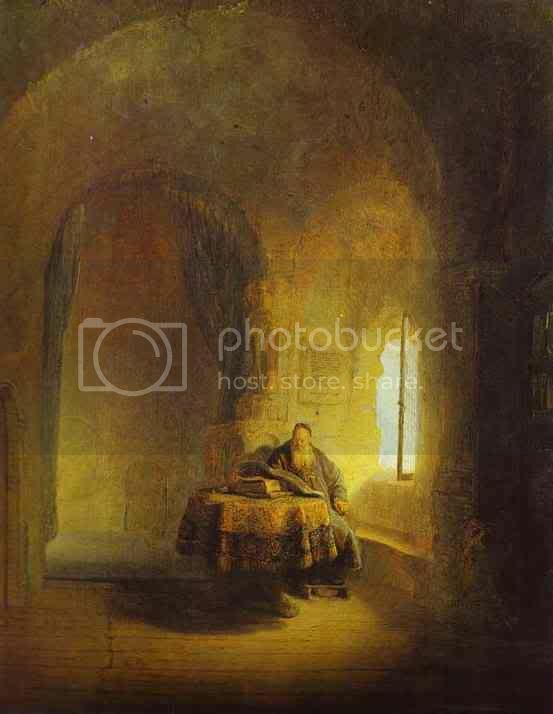 The painting below is of a monk reading scripture, by Rembrandt.